Associate Professor Christopher Lawrence is an Aboriginal health and wellbeing researcher. 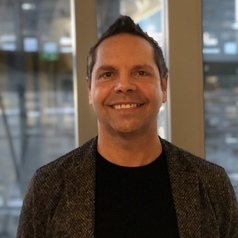 He has a background in education and postgraduate research degrees with a Masters of Applied Epidemiology and a PhD in Indigenous health and lifestyle choices. A/Professor Lawrence has been a Chief Investigator on many research grants including an NHMRC Tripartite study exploring Indigenous Resilience in Australia, Canada and New Zealand. He was also the 2008-2009 Australian-American Fulbright Indigenous Scholarship recipient and studied at Harvard University. In 2016 A/Professor Lawrence was awarded an Australian Research Council grant to explore how technology can help close the gap. A/Professor Lawrence is now the Head of the Centre for Indigenous Technology Research and Development in the School of Software at the University of Technology Sydney.